What happens if a team member cannot complete the training on time? When you purchase a training subscription for your team or corporation, learners have access to their assigned training as long as the contract is active. The only time that a learner loses access to their training records is if they haven’t accessed a course for two years. Periodically we clean up our database and we remove courses from learners who haven’t accessed the training for the past 24 months. We always notify administrators when we will be doing the maintenance. When training is assigned, the administrator does need to select an expected completion date, but learners have access to the training beyond that date. When you purchase credits for individuals through our online store, the learner has 30 days to complete the training. After 30 days the course cannot be accessed unless Course Renewal is purchased. Should we/can we do the training as a group? One of the big benefits of online training compared to classroom training is the flexibility with scheduling. In addition, when learners go through the training on their own, it is at their pace. For some who already are familiar with the topic, the training will go quickly while for others unfamiliar with the subject matter, they can go through the training at a slower pace. When you train as a group, inevitably the schedule doesn’t work for someone or a participant can’t make it because of an illness. But, there is an upside to learning as a group and that is group collaboration. Rich discussions on how the training applies in their specific workplace assures learners get the most from the investment of resources. We think that taking a blended learning approach is the perfect solution. It combines individual online learning followed by a group workshop to discuss how the training can be transferred to the job. How will I learn how to administer training? We always like to make sure new administrators get off to a great start with a 15 to 20 minute walk-through of how to use our Learning Management System. In addition, we have several “How-To” Guides and other helpful information for administrators if you are a fan of self-help. But we love to talk with our customers so, please don’t hesitate calling us (800-810-8326 or 802-496-5888) or emailing whenever you have a question. Can I print out the training? Because the training is interactive many of the pages can’t stand on their own and need the context of previous and subsequent pages or the depth of pop-ups and other functionality on the page that can’t be printed out. Some of the pages can be printed. If it is a page that we feel can stand alone (for example a list or summary or a clear graphic) you should be able to print it using the print icon in the right hand navigation panel (above the < and > buttons). More important, each course has a PDF Reference Guide (or a PDF Quick Guide for our shorter courses) that summarizes the key points in each lesson. In addition, in the appendix you will find tables, worksheets and other reference material pertinent to the course as well as a glossary of terms. To access the Reference Guide, go to your training records and select the course you are working on. On the screen that shows all of the modules for the course, the last items will be the Reference Guide. after it is opened in your web browser you can print it out, read it online or save it to your computer for your personal use. What are the system requirements for the training? Courses can also be run on iPads and Samsung tablets. With QualityTrainingPortal, instead of purchasing specific courses for specific learners, companies and teams purchase a Subscription that includes a number of Training Credits. The Training Credits are then used to assign training to learners. Our Master Courses are one credit per learner per course. Our Targeted Training and Overview courses are 1/2 credit per learner per course. Do you offer Green Belt or Black Belt Training? Yes, we have a recommended curriculum for Yellow Belt Training, Green Belt Training and Black Belt Training. 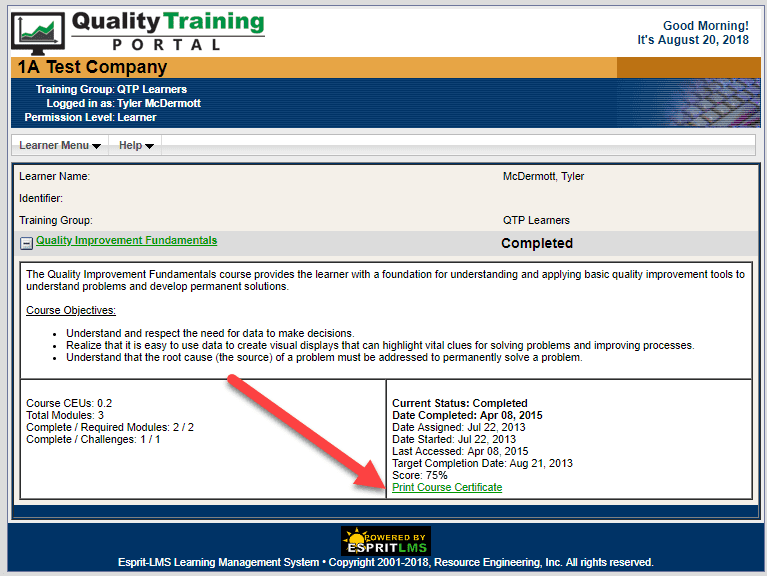 Do learners get CEUs or ASQ Recertification Units when the training is complete? Yes! CEUs are determined based on the estimated length of the course. Our Courses at a Glance shows the CEU value for each of our courses. Just print out your certificate upon completion and it will include your score for the course and the number of CEUs earned. How long do learners have to complete the training? Individuals who take training with us have 30 days to complete a course. Organizations with Team or Corporate Subscriptions set their own Target Completion Date. However, learners continue to have access to training after the Target Completion Date and will continue to have access to the training providing they have accessed at least one module within the past 24 months and the organization’s subscription is active. Do you offer Core Tools Training? Yes, we have a recommended curriculum for Core Tools Training. Is there access to a course after it has been completed? Learners in Organizations with Team or Corporate Subscriptions continue to have access to training after the course is completed and providing they have accessed at least one module for the course within the past 24 months and the organization’s subscription is active, they will continue to have access. This makes it easy to use our courses for required annual refresher training. Individual learners have 30 days access to courses they have signed up for. 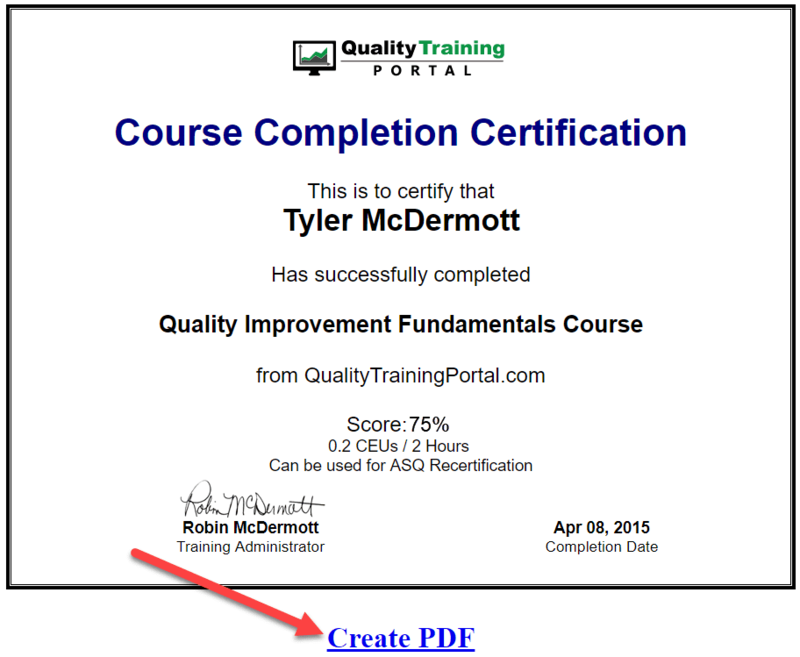 Do you provide a certificate once the training is completed? Yes! Once you have successfully completed a course, you will see a link for the course certificate in your records. You may print out the certificate or save it as a PDF. What if the training can’t be completed in one sitting? We usually recommend that learners spend no more than 45 to 60 minutes at a time on our courses. When learners are done with the training for that period of time, a bookmark will be set on the screen they are on and they will be taken back to that location the next time they access that module. Training courses vary in length depending on the topic and the type of course. Master courses are typically 5 to 10 hours of training. Overview and Targeted Training courses are shorter typically taking 2 to 3 hours.